Rinse quinoa in a fine mesh sieve under cool running water. Allow to drip dry. Heat a medium saucepan over medium-high heat and add quinoa. The extra water will steam off and eventually the quinoa will begin to toast a bit. Takes about 5 minutes total, you should start to smell the grains as they toast. Add 3 cups of water, a pinch of salt and bring to a boil. Reduce heat, cover and simmer for 15 minutes or until water is completely absorbed. Remove from heat and allow to sit covered for 10 minutes or so then fluff with a fork. Allow quinoa to cool before assembling the salad. Combine orange juice through ginger in a small mason jar and shake to combine. Adjust seasonings. You may want to add a bit more ginger. Set aside. 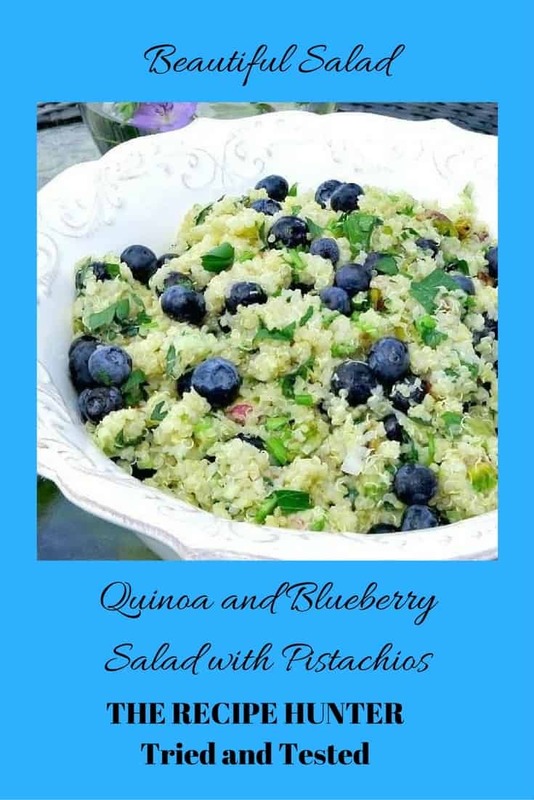 Toss quinoa, blueberries, green onions and pistachios in a large bowl. Serve slightly chilled or even room temperature. Thanks for sharing and pinning dear – Sharing is caring. Hope you get time to make it and enjoy it as well. I love quinoa, I love pistachios and I love blueberries so really its a matter of stopping me! Glad you ♥ it, me to, I think this will be made this weekend.